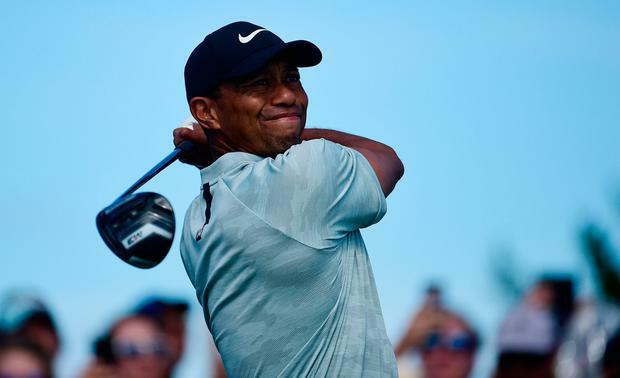 Tiger Woods suffered the triple bogey blues to find himself eight shots off the pace in his $3.5 million season-ending Hero World Challenge in the Bahamas. The host struggled with his irons and made a six in the par-three 12th in a 73 at Albany Golf Club, ending the day tied for 16th behind leaders Patrick Cantlay and Patrick Reed on one-over par. "I didn't quite feel comfortable and it was reflected in my scoring," said Woods, whose attempted recovery from the edge of a hazard at the 12th rolled back in the water from where he took three more to get down after a drop. Woods (42) undid some of the damage with birdies at the 15th and 18th but was well off the pace set by Cantlay and Reed, who shot seven-under 65's to head Henrik Stenson and Dustin Johnson by three strokes. There was better news for Mount Juliet's Gavin Moynihan in another island paradise as he opened his 2019 European Tour campaign with a sparkling 69 in the tri-sanctioned AfrAsia Bank Mauritius Open. The Portrane native (24) confessed after winning back his card at the European Tour Qualifying School that he got annoyed with himself too often last season and paid the price. But he was steaming for the right reasons at Anahita yesterday as he overcame tropical heat to open with a three-under 69 in his first start of the new campaign. He's tied for 22nd with veteran Ernie Els, just five shots behind in-form Challenge Tour graduate Victor Perez and India's S Chikkarangappa. And he knows it's important he starts the new season well after missing his first 14 cuts last year. Looking forward to starts in the South African Open and the Alfred Dunhill Championship at Leopard Creek before the Christmas break, he said: "I'm just trying to continue playing how I have been playing and see what happens. "It was very hot and humid, but I drove it great, scored well and made a few nice up and downs." He birdied the short fifth and hit an eight-iron stiff on the sixth to go two-under before following a solitary bogey at the par-three eighth with birdies at the 14th and par-five 18th, where he rifled a four-iron 235 yards to 30 feet and two-putted. Frenchman Perez (26), who was tied third on the European Tour debut in Hong Kong last week, carded nine birdies in a sparkling 64 to join Chikkarangappa on eight-under par. It was a day to forget for the Irish, and Australia's John Senden, in the Australian PGA at RACV Royal Pines Resort in Queensland. Michael Hoey and Cormac Sharvin posted six-over 78s and Tramore's Robin Dawson signed for an 80 as Jake McLeod and Matt Jager shot six-under 66s to lead by a shot from Dimitrios Papadatos and South Korea's Jaewoong Eom. But the unluckiest man on the day was Senden, whose driver shaft snapped at the handle as he began his downswing on the ninth, causing a "fresh air". "I had no chance of stopping the shot, so, unfortunately, that counts as one stroke," said Senden, who was two-under before the incident and ended up shooting a level-par 72. In Spain, Des Smyth and Paul McGinley battled to level-par 72s to share 22nd after the first round of the Costa Blanca Benidorm Senior Masters. Argentina's Rafael Gomez conjured an eight-under 64 to head Welshman Stephen Dodd by three strokes as Eamonn Darcy shot 73 to share 33rd and Brendan McGovern and Philip Walton a brace of 77's that left them tied for 47th.